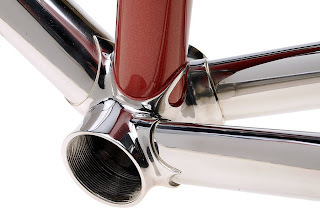 OK, Mike's frame was originally going to be a show bike for NAHBS, but I had to have a special run of stainless fork crowns cast at Long Shen and they didn't arrive until after the show was over. I did bring the frame, unpainted, so some of you may remember it in the raw. It's looking a bit sharper with some paint and it's final polish. 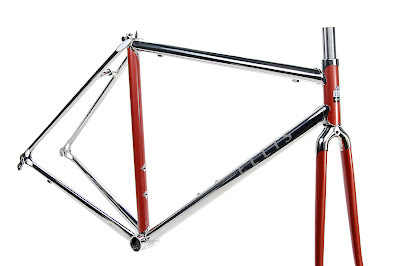 I made it with a full 953 tube set, but the seat tube and head tube are painted to match the darker Fizik red that Mike's using for the saddle and handlebar tape. 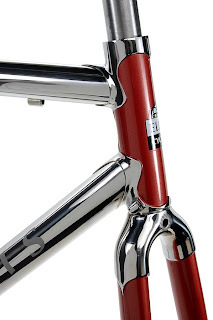 Close up shot of the head tube and the smooth, clean fork crown. 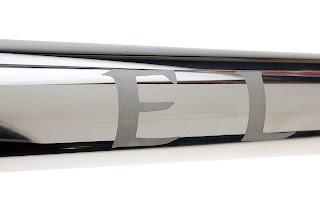 You can just start to see the Ellis logo bead blasted into the down tube. The 953 seat stays are single tapered, so I tried to blend them down gradually into the seat cluster with some slightly pointed caps. Really like the way this area turned out! Here's a close up of the bead blasted logo, very subtle. 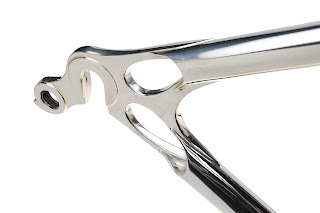 Another of my signature parts, the Ellis dropouts. I finish the tabs down to points before I braze them into the seat stays and chain stays. 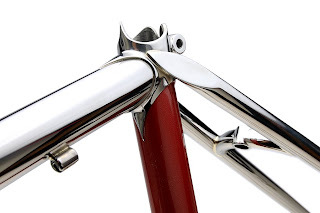 I also have to make my slots tapered to match the points, but it's a classic look and it keeps the braze from getting polished out of the joints like it would if I simply blended the dropouts into the stays. No hiding my work under paint here! And the bottom bracket. Check out how Jason masked the window behind the seat tube! Again, thanks to Drew at Ben's who took these awesome shots for me, I keep making his job harder with all the stainless bikes, too much shiny!!! Dave, you're in a league by yourself! Truly amazing work.